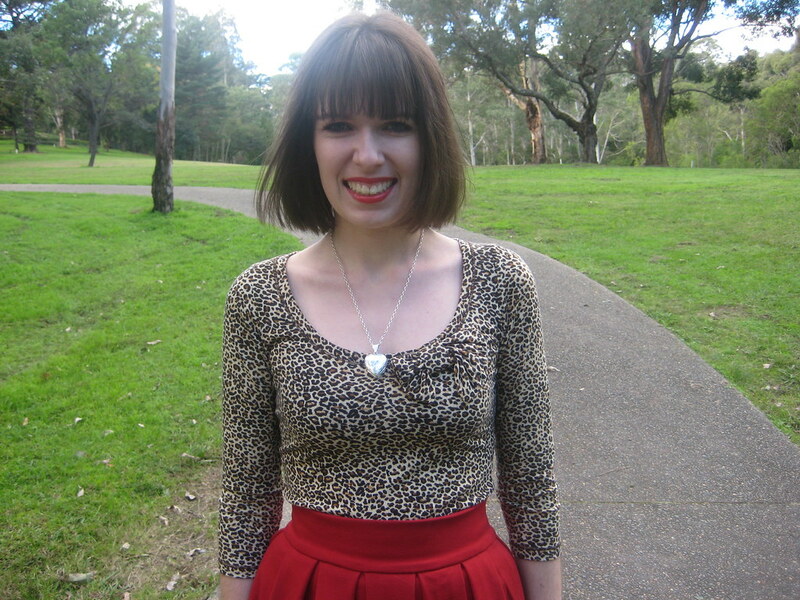 This outfit incorporates another skirt that I made in sewing class (which I am planning to show in more detail at a later stage) and my new leopard print top that I wore for the first time to work last week. 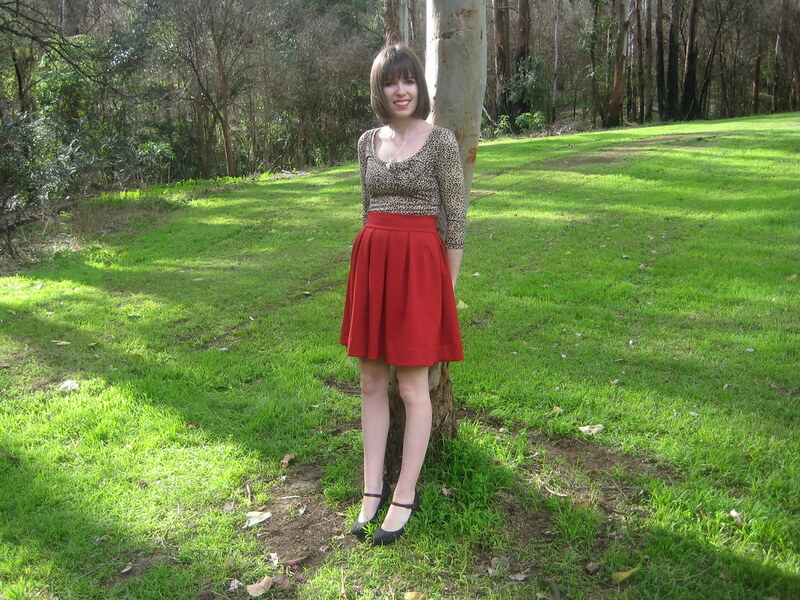 I love sewing my own skirts now and it makes me think twice before purchasing skirts at the shops. Unless it was a special occassion, I would probably always choose to make skirts now instead of purchase them. I also love how it addresses the deficiencies of the shops, primarily the lack of plain coloured skirts at a respectable length. I finally decided what to wear my leopard print top with. I have a few different ideas thanks to your comments but this time I thought red would look good. I am also wearing one of my trench coats yet again.It is becoming far too cold to dress in these sorts of clothes at the moment. Often I put up with the cold because I am terrible at dressing for winter but there is only a certain extent to which I can do this. This is my first outfit post with my new computer. It’s so exciting to have such a fabulous new computer. Now onto some life ramblings so if you are just here for the fashion then feel free to skip what I am about to write. I just need to express my views about certain aspects of life. For most of my childhood and teenage years I felt pressure to change certain aspects of my personality and to be someone that I was not and when I realised that some of these unique character traits were unchangeable I felt deeply unhappy and insecure about myself as a person. I remember when I was growing up, various sources always delivered the cliched message that we should just be ourselves, resist the peer pressure and everything would just fall into place. I never trusted this piece of advice. I believed it was only true in theory and not in reality and that no one truly liked the person that I was. Since the end of last year I have really tried to work on this aspect of my life by attempting to gain a clearer understanding and acceptance of who I am as a person. I always though these concepts were vague and lacked substance but now I don’t feel that as much and I am slowly accepting the person that I have become and realising that there are many aspects of that which I actually like. I feel like I am slowly making some progress. However, I have also realised that there will always be people who challenge your views and beliefs, who try and change who you are or who constantly voice their opinion over certain aspects of your life. I have realised that just because high school is over, it doesn’t mean the pressure to conform or think and act a certain way is over. It simply exists in a different form. For me, people are often saying, you’re too shy, you don’t have enough friends, you analysing situations and thoughts too much, you are generally too negative, you are too tame and innocent, you take things too seriously, you feel too much and have too many emotions, you need to relax, you have your priorities wrong, you have an extremely small comfort zone and many more. A range of people seem to want to try and tell me what I desire from life, like just because I am in my early twenties I am supposed to want to travel and I am supposed to want to go out to night clubs on Saturday nights. Everyone is a different person and no one can judge how another person feels or what another person wants from life. I think it is really hard to stand up for the person that you are and truly be yourself and I highly respect anyone that has the courage and confidence to do so. 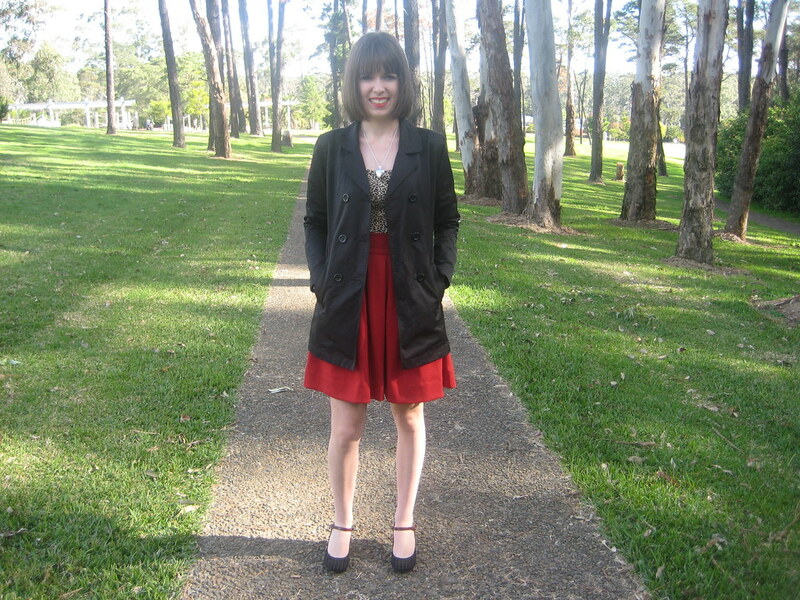 This entry was posted in Dangerfield, DIY, Outfits, Steve Madden. Bookmark the permalink. It sounds like you are continuing to develop beautifully, in talent, knowledge, emotionally and intellectually. Your designs are pretty and the sewing is very impressive. I like the heart locket and the settings for the photos too. P.S. : Thank you so much for your sweet comment on my last post – I appreciate it very much. love the new leopard top on you! 🙂 the bow is so cute! Love the red skirt with the leopard print, hot little number. The skirt is amazing. You did such a great job on it. I really need to learn how to sew. The leopard print top really suits you! 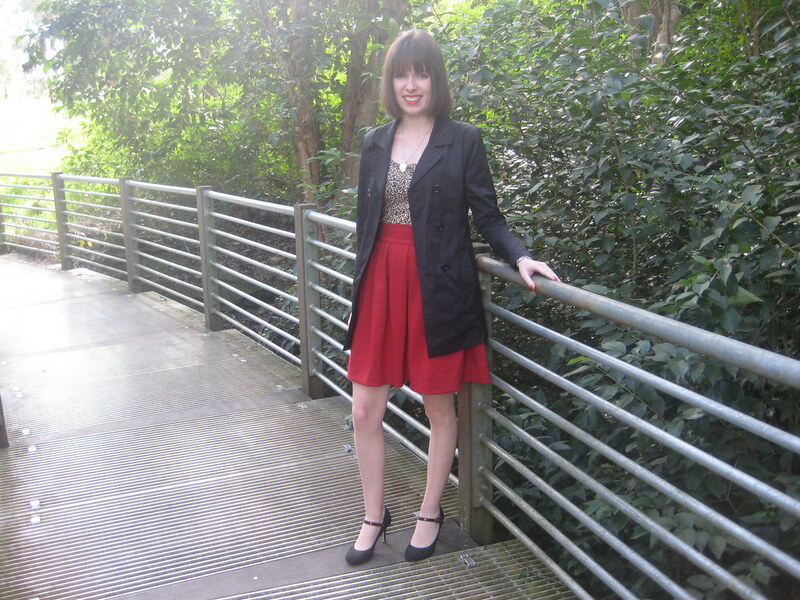 This is a fab outfit, red and leopard print is such a great combination! You look gorgeous. lovely, wonderful job on sewing that skirt! It's hard to find yourself but the important thing is to try 🙂 I like the red and leopard together! Oh your skirt is so pretty, I adore it!! And I too can relate to what you're feeling. I think no matter what there will be somebody out there who thinks they have the right to judge whatever you do. It definitely takes courage to ignore what they say and stand tall. Thanks for you comment on my engagement post! im super excited! Its a shame you have so many people telling you who to be. I have had that problem with one family member and it really does make me feel confused at times and like im not good enough. Hope you get things worked out real soon. Sounds like you need to surround yourself with positive people. That skirt is gorgeous on you! what a lovely outfit combo! the skirt is so adorablee!! Red and leopard print always, always, always go together. I firmly think you can never go wrong with that combo. lovely outfit, your home sewn skirt looks pretty. I hate it when people think they have some kind of authority to telll me how I should and should feel. Its rotten. You look very poised in that skirt and leopard print top. In your 20's there is a lot of pressure from peers and older people to be a certain way. But as long as you have aren't doing anyone any harm and have some goals I don't think you should worry too much. The people who are telling you to change may not be perfect themselves! Sweetie you look beautiful and you have amazing talent with the skirts! good for you. what a great post! and on a side note, LOVE the skirt. 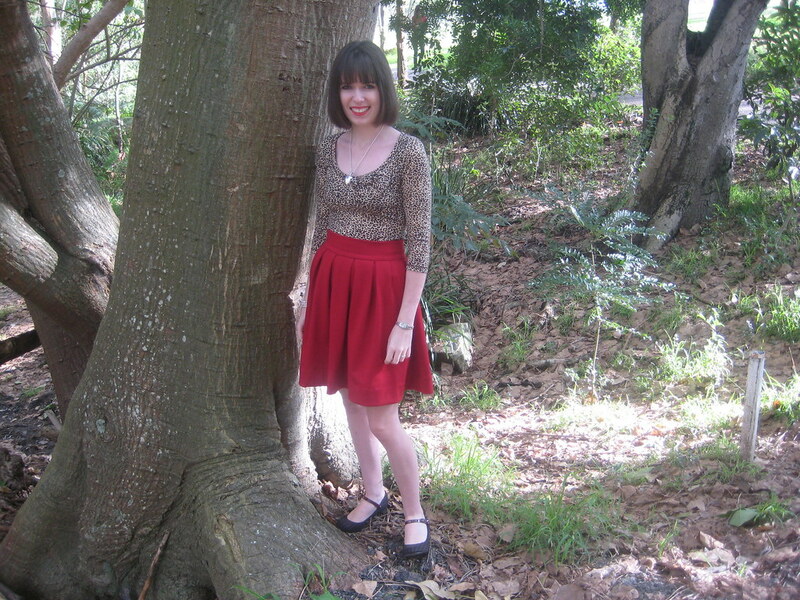 Those are all such wonderful pics; I really love your red skirt! And I'm going to email you more details about my trip to Australia soon. Your hand-sewn skirt is marvellous, Imogen. I absolutely agree that the shops are ridiculous. I can almost never find skirts that make me want to buy them, and it's annoying having nothing to wear my blouses with! Yes, people are stupid and will always want to tell you what to do. So long as you genuinely don't want to do it, don't listen to them. If you feel a niggle of wanting to, try it out. That's my (unsolicited) philosophy! Great job on the skirt. It looks great with leopard. Wow your skirt is fabulous, you're so talented! I have attempted at making skirts a few times but they've always turned out really messy haha! Also, it's always surprised me that even though you leave high school- the mentality never really goes away. No matter what age, there are people who still act like they are still in high school. Anyway, there is no need to conform to other people's expectations and it's definitely about being comfortable in your own skin. Definitely the most important thing! I love this outfit! The red skirt, is amazing and it looks better with that t-shirt. Fabulous outfit honey!! 😀 well done! I understand everything you are saying. I was surprised at how strongly I identified with your words! Even though I experienced my own identity crisis with my eating disorder, for the most part throughout my life, I had no problem with being “myself”. But I realize how often people invalidate other people's emotions, dreams, and thoughts. It happens to me everyday. There are those who always criticize me for what I do, my opinions, and what I say. While I would not say I am completely and utterly confident, hurtful words no longer hurt me. I have the ability to shrug of what people say regarding me because I know that my feelings are real and that I cannot alter who I am. Leopard and red…One of my very favorite combos! I didn't think leopard and red could look so good! Thanks for your comment about my engagement 🙂 About your question, I think it will be a couple of years until we get married. How long now until your wedding? I lovee your hair like this! Girl, people will always say a lot of things about other people. It can be true, or not. Some not nice people say it to make themselves feel better (I know, such horrible thing to do, right? but it happens). Take 'em with a grain of salt. Turn their negativity onto a constructive feedback or simply just move on. You know yourself better than anyone and of you listen to what your heart tells you to do, the love and passion will show – and you'll be happy. That's what matters most, right?